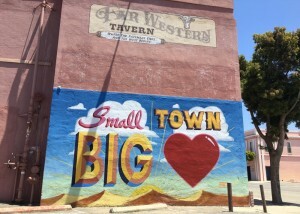 A temporary mural, created by an artist with roots in the Santa Maria Valley, now adorns the side of the former Far Western Tavern building in Guadalupe. The mural involved a collaboration between The Squire Foundation artist-in-residence program and the Dunes Center in Guadalupe, with the goal to share public art pieces that bring the community together. “We are excited to continue the tradition of art with the building that holds a special place in the heart of this town,” Dunes Center executive director Doug Jenzen said.